Moray James has a good post from a few years back of placing HIII's on Skylan Stands. He was very happy with his results. I have 2 milk crates, might just experiment a bit this weekend before getting to carried away. I honestly don't feel the need for a sub at this point, I am more than impressed with the quality of the bass from the H3's. I had built a couple of stands using plywood and pipe for my Heresy IIIs. I honestly didn't hear that much of a difference though. When I got my Anthem amp, after running some measurements both with and without the stands, they seemed to measure better on the floor. For what it's worth Have Heresy I's (yes; will "upgrade" on of these days to III's) on top of KPT-904 cabinets, so they're about 4 feet up. Have them "upside down" (tweeter on the bottom) and they sound a lot better than before (when they were on the floor). If the milk crates improve your mids and highs (due to horns being closer to ear level), you could always close off the crates with veneered plywood (and stain the veneer), to get back the bass (maybe). Line up the front of the speaker with the front veneer on the stand, in other words, make them flush. Make sure everything is solid and flex free and rattle free. JFHSQT's post (below) reminded me that when I have made changes in bass response, they may not show up or be very subtle with some disks, and be clearly different with others. Measurement (e.g. REW) is a good backup. Average 3 or more mic positions, in case one is in a null or a peak. 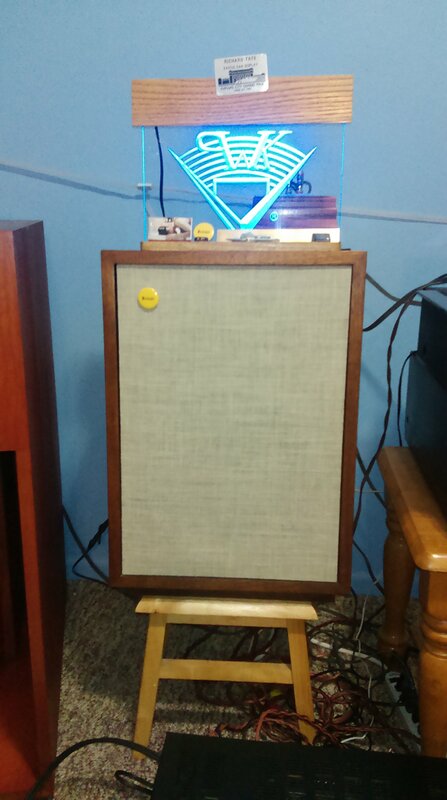 A very Interesting thread, as I am looking into/wanting a pair of Heresy to pair with my amp, but I have no floor space available. They would have to seat on an oak end tables. Interesting, but not very convincing....not sure what these get you? You are still decoupling from the floor, and, at a cost of $87 each? I HIGHLY recommend placing the H3's on the floor first, and listening. 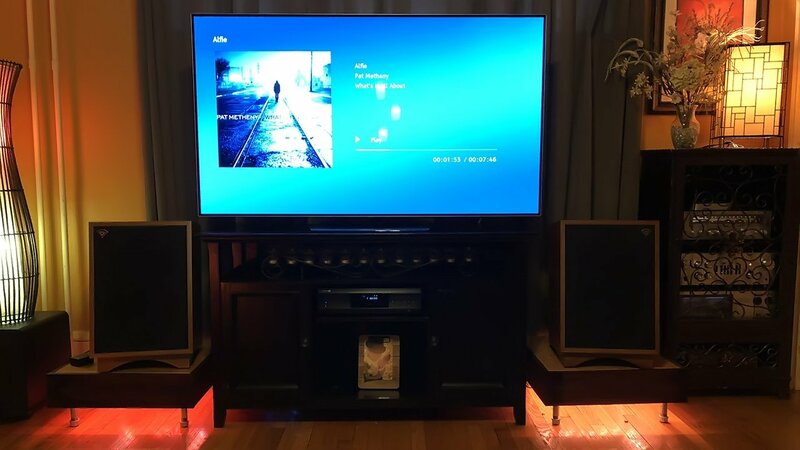 I agree with @jimjimbo and @Westcoastdrums and @carlthess40 and Paul W. Klipsch.😁 With speakers of a Klipsch-like design, you don't want the speaker decoupled from the floor (unless, perhaps, you are also using a good subwoofer). The Heresy III is designed to be on the floor. I suspect that any cavity under the Heresy III will reduce bass. The main justification for putting a Heresy III on stands is, as you say, to bring the tweeter more in line with your ears, but the a slant riser, available from Klipsch, aims the tweeter more nearly toward your ears, while still taking advantage of floor loading of the bass. The Heresy woofer is deliberately designed for moderate (as opposed to wide) cone excursion, partly to minimize modulation distortion. There are some speakers that create their high intensity, deep bass via extreme cone excursion. Most subwoofers fall into this category. But most subwoofers end up crossing over at 80 Hz or so, and are "outta-there" by 150 Hz, so significantly higher tones don't have to ride back and forth on a deeply pumping diaphragm, producing modulation distortion. A Hersey III uses the floor bass reflection, or at least the boundary gain of a solid stand, with no cavities to produce adequate bass down to about 58 Hz WITHOUT wide excursion. If the bass -- or, perhaps, just the bass down near 60 Hz -- is defeated by the presence of a cavity, it's unfortunate, to say the least. It is good that the Heresy III is a three-way, because that cuts down on modulation distortion. It is also good that the woofer excursion is moderate, and depends on the floor, because the woofer crosses over to the midrange at 850 Hz, about 2 1/4 octaves above middle C (261.6 Hz), and almost an octave above tuning A (440 Hz). A wide excursion speaker with a 850 Hz crossover forces middle C and tuning A to ride back and forth on a plunging cone, causing Doppler distortion (modulation distortion). The Heresy III avoids much of this, but needs boundary gain for flat bass down to its graceful roll-off. Awesome information and food for me NOT experimenting with raising my H3's. Thanks! I got some short stands from wally world but I still think they need to be on floor. You could use door stop wedges for a cheap solution also. These stands I got let me slide the back end off of it and it tilts them a good benefit. I cant find these stands anymore wally world does not have them anymore. "thinner" is a pretty good word for it!